04 October 2013, 09:09 a.m.
Around the world, market leaders in all industries have already deployed managed cloud services. Seeking to use business technology as a strategic lever to advance past their competition on multiple fronts, the senior executives at these leading companies are eager to learn about the next phase of cloud service development. 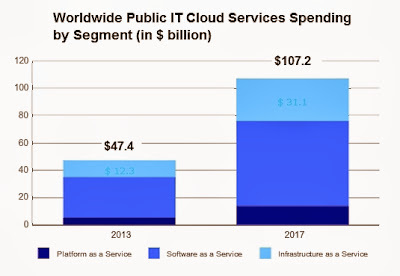 Worldwide spending on public IT cloud services will reach $47.4 billion in 2013 and will reach more than $107 billion by 2017, according to the latest market study by International Data Corporation (IDC). Over the 2013–2017 forecast period, public cloud services will have a compound annual growth rate (CAGR) of 23.5 percent, that's five times the IT industry growth as a whole. As one of the key technologies enabling the industry-wide shift, cloud computing has played a crucial role in changing the way companies consume and use business technology. IDC believes that there are signs that cloud services are starting to shift into a the next phase -- where the scale of cloud adoption will be much bigger and more user and solution driven. In this phase of growth, cloud and the other 3rd Platform technologies -- mobile internet, social, and Big Data -- will become even more interdependent as they continue to drive growth and innovation across all industries that depend on business technology. "The first wave of cloud services adoption was focused on improving the efficiency of the IT department," said Frank Gens, Senior Vice President and Chief Analyst at IDC. "Over the next several years, the primary driver for cloud adoption will shift from economics to innovation as leading-edge companies invest in cloud services as the foundation for new competitive offerings." The emergence of cloud as the core for new "business as a service" offerings will accelerate cloud adoption and dramatically raise the cloud model's strategic value beyond CIOs to CXOs of all types. An important factor driving growth in public IT cloud services spending is the expanding variety of cloud deployment options. The growing richness of these options is a clear accelerator for overall cloud services adoption. The emergence of virtual private cloud (VPC) offerings has helped to shift momentum from dedicated private cloud offerings toward public (shared/multi-tenant) cloud offerings. By offering the attributes of public cloud (economics, scale, pace of innovation) with some of the privacy and control features associated with private cloud, VPCs are effectively addressing many of the objections that have held customers back from the cloud model. Similarly, growing commoditization and competition is expected to bring about consolidation in basic cloud services (infrastructure as a service offerings), and will force vendors to expand their offerings toward higher value services. While commoditization is expected to result in lower pricing and tighter profit margins, the competition will greatly expand the addressable market of solutions and customers. In order to survive, service providers will have to scale their offerings "up and out" toward a broader range -- and dramatically larger number -- of customers. The growing focus on cloud services as a business innovation platform will help to drive spending on public IT cloud services to new levels throughout the forecast period. By 2017, IDC expects public IT cloud services will drive 17 percent of IT product spending and nearly half of all growth across five technology categories: applications, system infrastructure software, platform as a service (PaaS), servers, and basic storage. Software as a service (SaaS) will remain the largest public IT cloud services category throughout the forecast, capturing 59.7 percent of revenues in 2017. The fastest growing categories will be PaaS and Infrastructure as a service (IaaS), with CAGRs of 29.7 percent and 27.2 percent, respectively. IDC predicts that the United States will remain the largest public IT cloud services market, although its share will decline from 56.9 percent in 2013 to 43.9 percent in 2017 while Western Europe, Latin America, and Asia-Pacific will each gain share throughout the forecast. Cloud spending in emerging markets is expected to experience a CAGR of 37.3 percent for the 2013-2017 period, a rate almost twice that of developed markets. "In this second phase of cloud development, it will be essential for cloud services providers to reexamine their cloud strategies, preparing for a marketplace focused intensely on business innovation, industry transformation, and increasingly pressured pricing and operating models," noted Gens. "How suppliers navigate the next two years will tell us a lot about who the IT market leaders will be for the next two decades."